I want to welcome you all to another edition of Watch Out. This week I’m excited to bring you a great author by the name of Yolanda Sfetsos. Welcome Yolanda, it is so great to have you here this week. Hi Savannah, it’s great to be here. Thank you for having me over on your blog today. For the readers out there who might not know about you or your work, can you please tell them a little about yourself. I write in a variety of lengths and genres—urban fantasy, paranormal romance, sci-fi, futuristic, horror—but all of my stories deal with something otherworldly. I’m a little obsessed with the supernatural. Can you tell us a little about your current release? Well, I’ve actually got a few current releases. Let’s start with my short novel from Eternal Press, TOUCHING MOONLIGHT. It’s a futuristic romance story about a man called Silver, and a woman called Sunny—two people from opposing clans who find themselves in the middle of a very serious situation that could devastate life as they know it, unless they do something about it. It’s now available in several eBook formats, Kindle, and in print. There’s also a new eBook publisher called Evernight Publishing, and I’ve actually got a few books contracted with them. 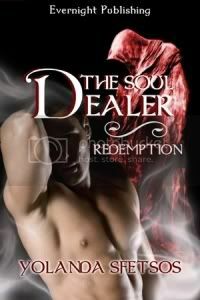 I’ve got a paranormal romance two-part novella series called THE SOUL DEALER, which is now available. This one is about a mysterious entity known only as the Dealer, a creature that offers two different couples the chance of a lifetime, or at least, the chance to overcome death. I’ve also got a two-part Christmas novella series featuring demons coming this festive season with Evernight. I was looking around your page and was checking out the books you’ve published. I must say I love the fact that you have branched out and write in so many genre’s including horror. Out of all the genre’s you’ve been published so far do you have one you consider a favourite? When it comes to writing, I’m as open to variety in genres as I am with my reading. Actually, my most favourite thing to do is to mix them all together. But if I had to choose only one, I would have to say urban fantasy’s my most fave, because there are so many boundaries that can be pushed within this genre. But I also love Sci-Fi, and futuristic books, so like I said… I love them all. lol. Although, I’ve found that no matter what genre I write in, there’s always something otherworldly in my stories. I can’t stay away from the paranormal/supernatural, that’s for sure. What is the one thing readers might be surprised to know about you? They might be surprised to know that I don’t actually have a desk, or an office. Oh, and that I collect car models and die-cast toy cars. But not just any cars, they must be VW Beetle (old & new), Kombi, Kombi truck, and 67-69 Chevy Camaro. My collection’s getting pretty big now. Is there anything you are currently working on that you can give us a taste of? I see you are a 30 Seconds to Mars fan. From one fan to another have you ever had the chance to see them live? What did you think of the show? OMGosh, I absolutely adore 30STM. I find their music so inspirational. And yes, we had the pleasure of going to their concert this year. They came to Sydney at the end of July, so hubby, daughter, and I went to watch them. They were outstanding! The show was a lot of fun and Jared Leto sure knows how to get the crowd involved. He cracked me up, and they sound SO good. It was an experience that I hope we have the chance to revisit someday. Hubby even got me a Triad necklace, which I love. By the time this goes live, I probably would’ve read another ten books, lol. But right at this very moment, I’m reading a YA book called EMBRACE by Jessica Shirvington. It’s a story that features angels. It’s pretty interesting so far. Some authors when they write they need total quiet. Do you write with music or a TV on? If you do, does it help the creativity flow? When I first started writing, I used to always need music in the background to get in the mood, but after my daughter was born, I got used to silence because I’d write whenever she was napping. Now, I can work with music or in total silence. It makes no difference to me. Though I can’t have the TV on in the background, because it ruins my concentration. I also love putting playlists together. Though if I’m revising, I prefer total silence. What do you do when you have writers block? I go for a walk, plug in my MP3 player, and let my mind run free. And before I realise it, random thoughts start invading me, until I eventually work through it. I also find that reading helps get that spark back. Oh, and pulling out my trusty notebook and pen helps heaps, too. Taking notes can sometimes get me out a jam, it’s great! What is the one thing that surprised you in this industry? If you were not an author what would your dream job be? What is the biggest misconception you think people have about authors? That we’re all weird, and as soon as we’re published we’re making big bucks. It doesn’t work that way, and personally, my motivation to write has never stemmed from money-making. I tell stories because there’s something inside me that won’t have it any other way. There’s a LOT of hard work involved in getting a book from idea to polished, and then being published. Is there one specific genre you would like to be well known for? Definitely urban fantasy. I have to admit that I would love to have my urban fantasy stories read widely. What advice do you have for new writers out there? This might sound cliché: but don’t give up. I still tell myself the same thing every single day. I’ve achieved a lot of my personal writing goals, but I still have many more to achieve. So it’s important to keep going and never give up. Oh, and keep writing, because the more you write, the better you get, the more you’ll learn, evolve, and the more you’ll want to do it. Thanks so much for having me here today, Savannah! It was a lot of fun. 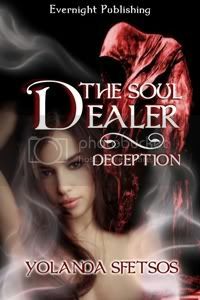 Great interview – I thought The Soul Dealer is a wonderful read. Good luck! Julia thank you so much for coming out to check out this weeks interview. And thank you Julia for stopping by, and for your kind words. I’m really glad you enjoyed The Soul Dealer. Yolanda thank you again for being my guest this week. It is a pleasure to have you. You always pick such interesting people. Casey, thank you so much for coming out to support Yolanda and Watch Out. I try..I hope you enjoy the guests that are to come in future interviews. I’d liked the answer about misconception about authors! I agree though that we are all a bit weird, ok, maybe more than just a bit! Eden- Thank you so much for coming out to check out the interview…Thank you for your support. I am looking forward to having you as my guest. You are so right about writing to publishing being hard work. I’m glad you pointed that out. Your books look interesting. I love finding out about new authors on Savannah’s site! Kissa thank you so much for taking time to stop by and check out the interview with Yolanda. I’m so glad you like my guests.